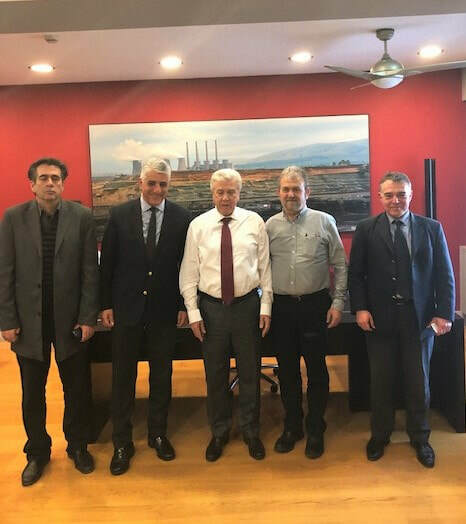 MEETING WITH THE PRESIDENT OF PPC S.A.
On 30/01/2019, a meeting was held at the Headquarters of PPC S.A., between the President and Managing Director, Mr Panagiotakis Emmanouil, the Sustainable City city network, the Municipality of Megalopolis and LIGNITIKI of MEGALOPOLIS. The purpose of the meeting was the PPC’s invitation to cooperate with the aforementioned bodies, aiming at joining the European Commission for Energy Transition in order to achieve a smooth transition of Megalopolis to the Metallurgical era. Sustainable City has carried out a series of actions in cooperation with Megalopolis, which were presented to Mr. Panagiotakis with culmination on the meetings with the European Network of Energy Cities and the European Commission, in Brussels, for the Framework for Combustible Regions in the Energy Transition. The objectives of the meetings were to secure funding, which would contribute to the upgrading of the economy of the Municipality in order to prepare them in a timely manner for the transition to clean energy. Mr. Panagiotakis expressed the certainty that PPC will contribute in every way to the smooth transition of the Municipality of Megalopolis to the metallurgical era and took the envelope with the whole history of the Sustainable City’s actions in cooperation with the Municipality of Megalopolis, in order to evaluate it.